New Employees: Activate your NetID using the activation code sent to your personal address. Current Employees: Login using your NetID and password. Please refer to the CSUEB NetID self-service website for password resets. MyHR is available 24 hours a day and seven days a week. There will be a short window of “downtime” for system maintenance each night. What is the difference between MyHR and MyCSUEB? MyHR is Cal State East Bay’s self-service system for employees, including student employees (student assistants). MyCSUEB is Cal State East Bay’s self-service system for incoming and matriculating students and faculty center. How do student employees submit an address change? Student employees should submit an address change using MyCSUEB. Please refer to the payroll website for Staff payroll calendars and Academic payment schedules. Whom should I contact if my paycheck was mailed to the wrong address? Employees should contact their department office manager to ensure they have the correct mailing address on file. When will my Employee access become available? Access to the Employee tab will become available the morning after your appointment is processed by the Payroll Office. I no longer see an Employee tab within MyHR? You must have an active appointment in order to gain access to the Employee tab. Who should I contact if the Reporting Structure report is wrong or a position changes in my department? Your first contact should be your Human Resources manager/analysts. When is the Finalized Absence Activity report available? The report for the most recent pay period is available once Payroll has processed and finalized all absences for that pay period (typically around the 15th of the month). How do I report CTO I have earned? CTO time should be reported via the Absence and Additional Time Worked Report. How do I report FMLA hours? The processing of FMLA is still manual at this time. An Absence and Additional Time Worked Report should be submitted to the Payroll Office and Leave Coordinator (HR). Is this system for faculty too? Yes. All employees eligible for leave are required to use self-service to view and report time. Who will approve my absences? Your direct supervisor will be given access to review and approve your absences online. Do I have to do anything if I don’t take any time off? Yes. You must report “No Leave Taken” indicating no leave usage during the specified pay period. What is the deadline each month for keying and approving absences? All absences must be reported and approved by the close of business on the first day of the next pay period (e.g. for July 2018, this would be August 1, 2018). How do I enter my overtime? Overtime should be submitted via the Authorization for Overtime form. What type of absences can I report online? The following types of absences can be reported online provided that you’re eligible to take them and have a sufficient balance where appropriate: Vacation, Sick, Personal Holiday, Compensatory Time – use, Alternate Day Off (ADO), Holiday Credit, Jury Duty, No Leave Taken and Funeral Leave. All other leave types should be reported to payroll via the Absence and Additional Time Worked Report. When will my new balances be available? Leave balances are typically available by the 15th of the next pay period. Do we still have to submit the Attendance Roster? Only Academic Departments are required to submit Attendance Rosters. Should we still manually add names to the Attendance Roster if they are missing? Yes. That process has not changed. How do I designate an alternate approver? Managers should send an email to your HR Manager. Please include the name of the current approver and alternate. Can I submit an absence for a closed or finalized pay period? Employees, managers and timekeepers may submit absences for the two previous pay periods online. Once late entries have been reviewed and approved, those entries will be processed with the next absence calendar. My time and labor access does not appear on the Manager/Timekeeper tab? Employees must submit an Access Request via the service desk to gain access to manage student and hourly work hours. I don't see my student listed under my department ID? Confirm a Student Employment Action Form (SEAF) has been submitted and employee has completed the necessary sign-in documentation in the Payroll Office. How do I clear system exceptions? Please refer to the Manage Exceptions user guide for step-by-step instructions. I can't report prior month work hours. Employees lose the ability to report work hours at 11:59 p.m. on the last day of the respective pay period. Timekeepers are given a four calendar day grace period to enter, review and correct eny work hours. Adjustments required beyond the allotted grace must be coordinated with your payroll technician. How can I review or confirm work hours have been approved? Please refer to the View Status of Report Work Hours user guide for assistance. The computer timed me out in the middle of the applications process...or I logged out of the system. How do I access my saved application? Your application may currently be in DRAFT form, meaning it has not been submitted. Once you log into the system you will need to click on My Career Tools. 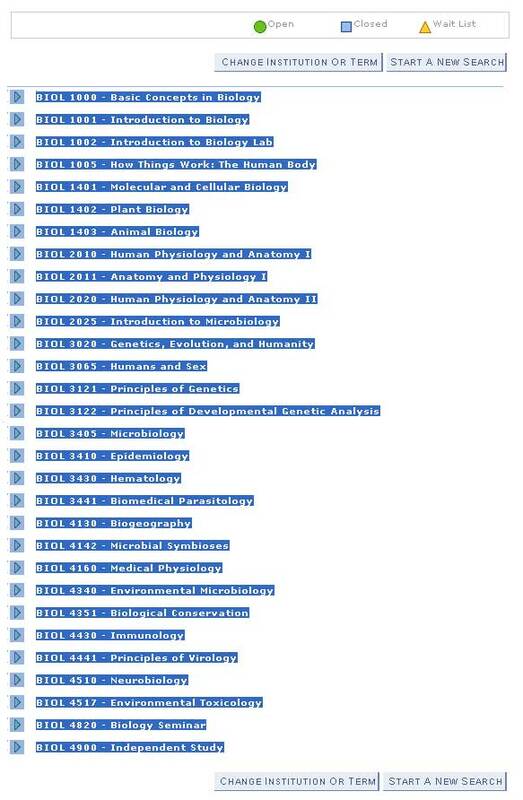 From there you will be able to click on the "Job Title" link of the application that you would like to complete. Please Note: If you attempt to view your applications by going back through the job posting, you’ll receive an error stating that you have already applied for the position. If you continue to have problems, please email apply@csueastbay.edu with your name and the four digit job opening number. I did not receive an email confirmation when I submitted my application, did you receive it? Please log back into the Careers homepage, open My Profile and verify your e-mail address is typed correctly OR check your e-mail spam and/or junk folder. If you still have not been able to locate an email from us, please email apply@csueastbay.edu with your name and four digit job opening number and we will verify with you that you have successfully applied for the position. How do I get the status of my application? Due to the high volume of applications, The Office of Human Resources is unable to provide current application status to individuals. The hiring committee will contact applicants who have been selected for an interview. At the conclusion of the recruitment process, all applicants will receive a notification the position has been closed. Please be patient as this process may take a considerable amount of time. What do I do if my major code is not listed? Applicants should select the closest major and email apply@csueastbay.edu outlining their name, four digit job opening number and their exact major title. After submitting, how do I update my application, delete a document and/or upload additional document(s)? Unless there is a technical error which prevented an applicant from uploading the appropriate documents, we will not accept revised documents. Should an applicant have a technical error, he/she should send an email to apply@csueastbay.edu, providing his/her name, four digit job opening number and the attachment(s) in a Word or PDF format. Can I have the name of the hiring manager or committee members? We only disclose the names of the hiring manager and/or committee members when an applicant is contacted for an interview. I see a position has been posted for a considerable amount of time. Are you still accepting applications? If a job is posted you may still apply. However, depending on where the hiring committee is in the process, your application may or may not be reviewed. Can I negotiate a higher salary than the posted maximum? Typically, the starting salary falls within the posted salary range. However, the applicant can inquire about negotiating a higher salary which will be evaluated on a case by case basis. Most full-time positions are Monday - Friday with varying start and ending times. Part-time work hours vary as well. The schedule can be clarified during the interview process. What benefits are offered with this position? Please refer to the HR Benefits Page for more information. Am I required to complete the online application and upload attachments? What if I need assistance completing my application due to a disability? Applicants needing assistance are encouraged to come to the Office of Human Resources in SA 2600 or contact the office at 510-885-3634 so that assistance can be coordinated. If necessary a representative may also contact us. Does Cal State East Bay sponsor non-US citizens for staff or management positions? I've applied to several positions and have not received a call for an interview. Can someone give me advice? We appreciate your interest in employment with the university. The hiring committee will review your application to ensure you meet the minimum qualifications (MQ’s) as stated in the job announcement. If you meet all of the MQ’s, your application is further reviewed against the other requirements of the position. Applicants whose qualifications are the closest match to those requirements are selected for an interview. If you are not contacted for an interview, it is because you did not meet all of the MQ’s or if you did meet the MQ’s, other candidates were more qualified. Is there a preferred browser for working in MyHR? 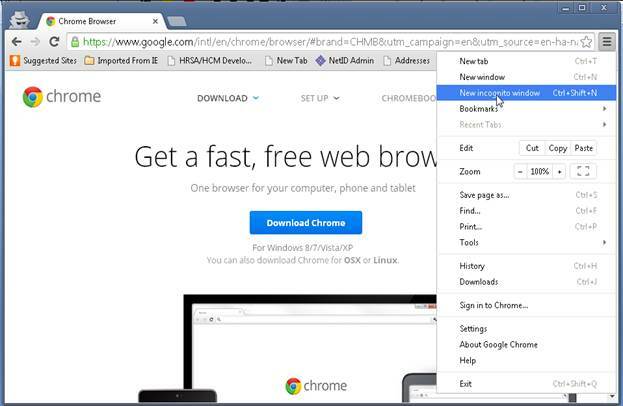 Firefox is the recommended browsers for use with MyHR. Please use an up to date version of the browser, appropriate for your systems/device. There is no charge to install or use Firefox. Google Chrome users may experience a "page expired" message while using MyHR. If you see "page expired" while using MyHR on Google Chrome, please use Internet Explorer or Firefox. 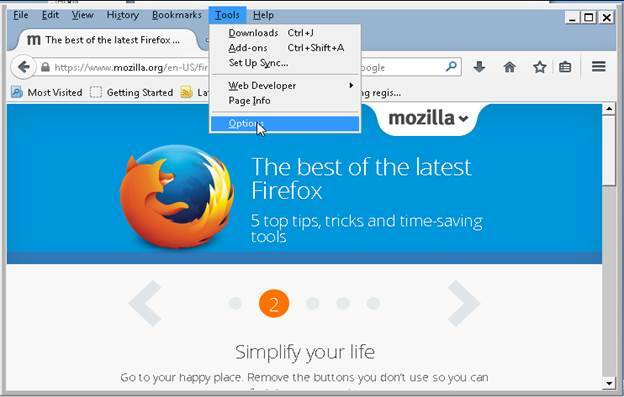 Internet Explorer users may experience pop-up security warnings when using MyHR. If you see these warnings using IE, please see East Bay Solutions. 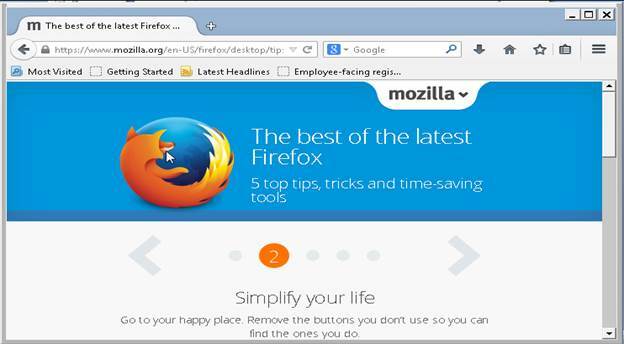 Performance problems have been reported when using Firefox 4.0, with MyHR. Please try a newer version of Firefox. When using MyHR on Apple Mac computers, some versions of Safari may produce errors. If you experience difficulties using Safari, please install and use Firefox for Mac. Do I need any special software to access MyHR when I'm off campus-like a VPN? Since PeopleSoft is a web-based system, you do not need any special software to access MyHR when you are off campus. You can access the system from any computer that is connected to the Internet—and you do not need to use a VPN. When I sign out of MyHR, is there an easy way back to the login screen? Yes, simply click on the Return to MyHR link. Why is it good to clear my browser cache and how do I do that? When working on the Internet, your browser keeps a copy of the pages you visit (in cache) so that the next time you visit them, the browser can load them to your computer in less time. You should clear your cache regularly for two reasons. First, having a page in cache can sometimes cause a conflict with a page that you are trying to view. (If you suspect this may be the case, go into your browser options, clear the cache, close the browser, then re-open the browser and try again to view the page.) Secondly, having a large number of files in your cache will slow down your browser and take up space on your hard drive. Does PeopleSoft have any special requirements regarding pop up windows? PeopleSoft often uses pop up windows to display information you request. If your browser is set to block pop up windows—and most are set that way by default—then PeopleSoft will not work properly. 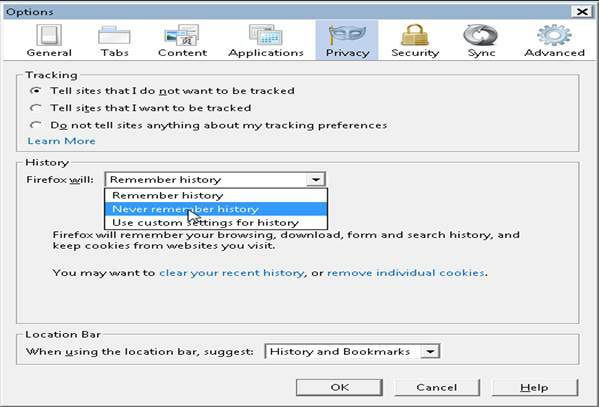 If you click on a button or a link and nothing happens, you probably need to adjust your pop-up blocker settings. 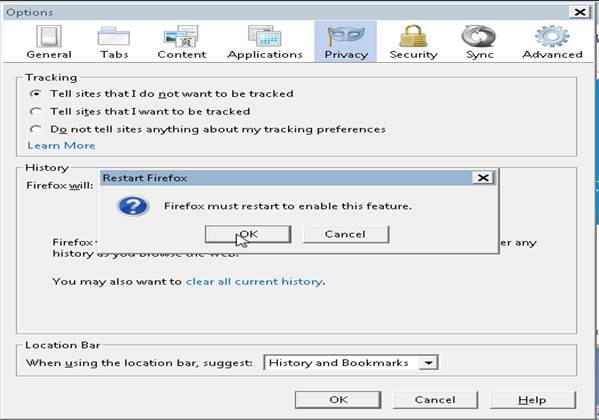 It is possible to leave your pop up blocker turned on (to protect you from intrusions from other Web sites), while adjusting it so that pop up windows open properly when you are in PeopleSoft. For example, you can allow pop ups for my.csueastbay.edu. Why does Internet Explorer ask me if I want to open MyHR because it contains both secure and non-secure items? If you are using Internet Explorer, you may receive a security warning asking whether you want to display nonsecure items. This does not represent a security threat—the page you are trying to view is a secure page. There are several options for dealing with this warning such as allowing Secure and Non-Secure Items for specific information. Please see East Bay Solutions. How do I resize text sizes in Internet Explorer? Internet Explorer has a limited text resizing feature. Point to Tools on the menu bar. Choose "Ignore font sizes" and press OK (other options include "ignore colors" which helps users with visual impairments/color blindness). Now if you want to resize text, you can choose View menu, point to Text size, and choose your preferred size (e.g. Largest). 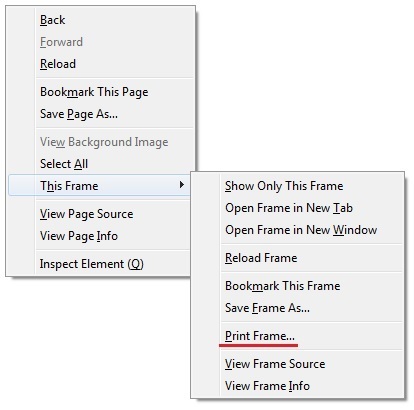 To print multiple page of a report using the FireFox browser, place the cursor over the report and right click, then select This Frame > Print Frame. 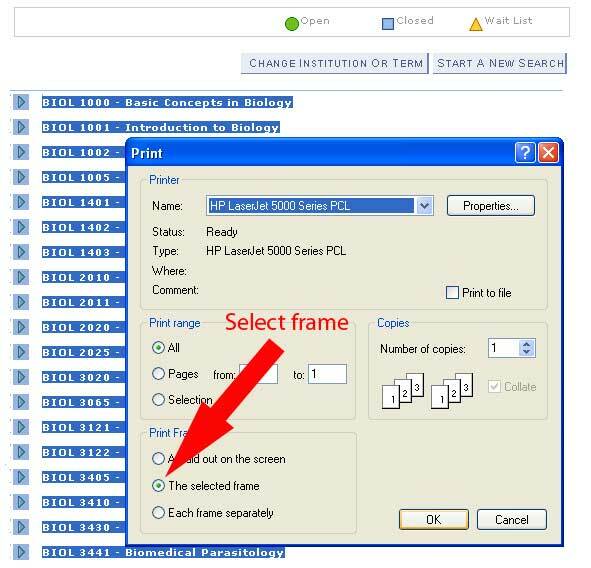 Make sure 'The selected frame' is selected, then click OK. The output prints the entire selection. 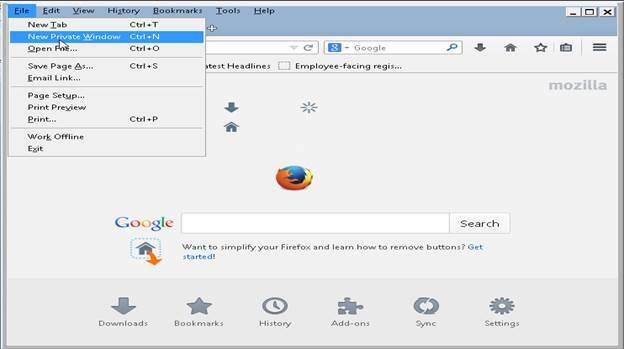 Open the Firefox browser like below. If you do not see MENU BAR like above, please click ALT key on your keypad to show the MENU BAR like below. Then, you can click on VIEW, go to TOOL BARS, and make sure MENU BAR is checked. In this way, MENU BAR will be on the top whenever you open Firefox browser. Click on FILE, go to NEW PRIVATE WINDOW like below. Then, in that Private window, go to my.csueastbay.edu to log in. 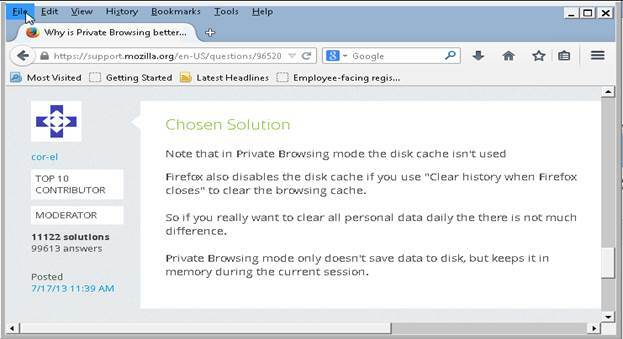 In this way, the browser won't keep your cache. 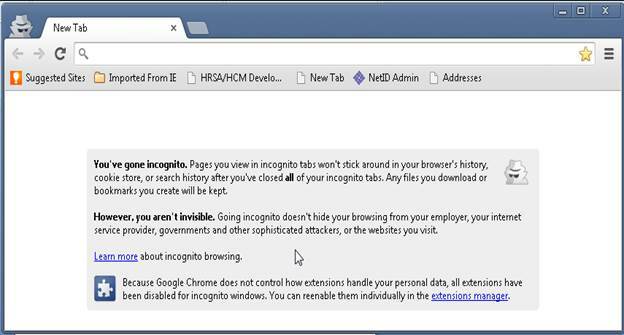 Click on 'Customize & Control Google Chrome' icon on the top right most corner to go to 'New Incognito Window'.